Ron Popeil is an American inventor and TV marketer, best known for designing affordable kitchen utensils, and founding the “Ronco” marketing company. He also created attractive and memorable infomercials using his trademark catchphrases. Popeil was born in New York City in 1935. His parents got divorced when he was very young, and he had an unhappy childhood, moving from his parents’ house to a boarding school. At the age of seven, Ron and his brother were taken home by their grandfather in Florida but he was a strict patron and the boys were unhappy living there. At the age of 17, Popeil moved to Chicago and went to work for his father to learn the trade from him. Popeil’s father, Samuel J. Popeil, was an inventor as well, and some of Ron’s earlier famous creations were based on his father’s gadgets. He also discovered a flea market in Chicago called Maxwell Street that helped boost his career considerably. He also demonstrated his products at Woolworths’ in Chicago where he earned in excess of $1000 per week. After acting as his father’s distributor for a few years, Popeil eventually opened up his own company named “Ronco” in 1964. When Popeil was working for his father, one of the products he undertook to sell was a vegetable chopper called “Chop-O-Matic”. Priced at $3.98, this was one of the bestselling products of his company and sold over 2 million units. The only problem was that salesmen could not carry enough vegetables with them to demonstrate the chopping process at each house. The solution was to record a video demonstrating the use of the gadget. This led him to think about advertising these videos as a commercial on television. Television commercials and Popeil were an instant match. Popeil’s natural selling skills could now reach crowds of millions and further sales began to pour in. Ron had a long list of bestselling products with his company Ronco. One was a device called the “pocket fisherman” that is a small tackle box with hook, line, and sinker all in one. He called it “the best fishing invention since the fishing pole and only for $19.95”. Another invention was “Mr. Microphone” – a low powered FM modulator and radio transmitter that would broadcast using an FM radio. Another of his bestsellers was the “Showtime Rotisserie” oven for cooking chicken and BBQ. In his infomercials he used the line “Set it, and forget it!” to pitch the product to audiences. Other products include smokeless ashtray, drain buster, bottle cap opener, electric food dehydrator, egg scrambler, hair formula to cover up bald patches, Dial-O-Matic and pasta maker. 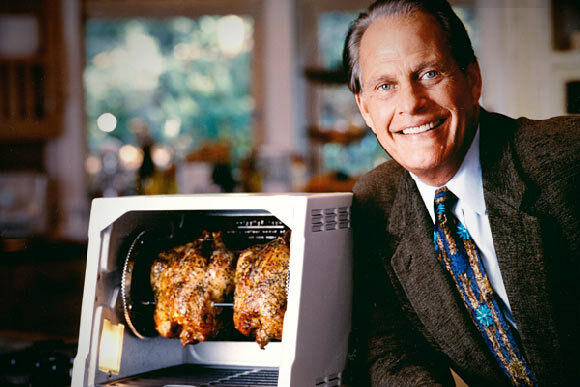 Ron Popeil is as well remembered for his innovative and practical kitchen gadgets as he is for his infomercials. In his infomercials, he engaged audiences using popular catchphrases such as “But wait, there’s more” and “Operators are standing by”. He is considered a pop icon and has appeared in many popular television shows such as The X-Files, Simpsons and The Daily Show, among others. Malcolm Gladwell interviewed Popeil for one of his bestselling books. His net worth is estimated to be around $100 million and in the last 40 years his products have brought in about $1billion in sales. He rescued his company from financial turmoil by injecting some of his own money into the business when the company was in dire straits. In 2005, Ronco sold his company but stayed on as an invention and sales consultant. He currently lives in California with his fourth wife and their two daughters.